This entry was posted in Freeware, Plugin, Techno Freak, Web, Wordpress and tagged add, dashboard, database, delete, edit, edit any table, free, freeware, MySql, php, phpMyAdmin, plugin, record, records, update, widget, wordpress by RedEyedMonster. Bookmark the permalink. How can I bring Edit Any Table to the front page?
! still there. Amy one that have some hints? It’s in Dashboard / Home (Welcome to WordPress!) if it’s a widget, or besides Home and Updates if it’s not a widget (a Separate Admin Page). Good plugin, looks to progress really well. 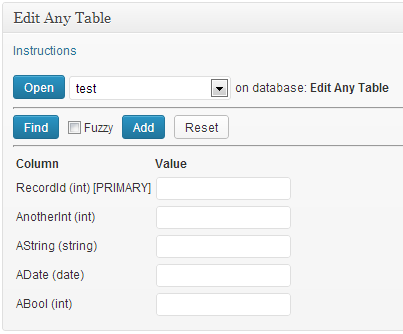 (1) a select All tables checkbox, saving the need to check everyone. (2) display table columns vertically, so you can see much more data on the scereen. Currently you only permit a max of 10 fields across the page, but with vertical columns, you see many more fields, only dependent on scrolling the window. 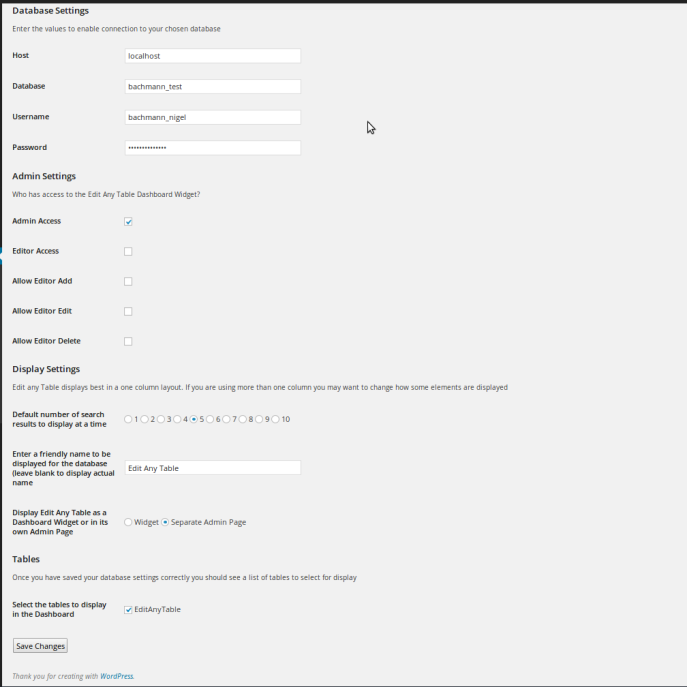 Bug: settings page: keeps auto loading incorrect password from a previous bad attempt to connect (in the end i had to reset database password wordpress user to none, for your plugin too work). the plugin works only partially. I am supposed to have access to edit columns (all checked for admin and editor) but I can only add new rows without being able to change existing ones. Hi Ivan, this is a tough one as I think Edit Any Table is working correctly and I assume, as you can see the settings page you are Admin. I think, maybe, you need to check the permissions of the account that you are using to access your database and ensure that this account has full access. The account indeed has all permissions enabled regarding the particular database. Hi Ivan – I have added a debug mode on the settings page which may help you resolve your issue. Fantastic Plugin, is there any way of embedding this on a webpage on my site rather than my dashboard. I need to allow access to it by a third party but not through my dashboard. I’m thinking of putting it on a password protected page. Can you help. I have been asked for this a couple of times now so may include the functionality in the next release. I hope you are able to do this. I am looking for a way to have my database searchable by my viewers. Was this every added? I would like to do the same. I can open the table that I want to edit but always get “No results found” message. I have tried searching the wp_users table and wp_posts table. Both tables do have entries. Even a blind search produces nothing. is it possible to embed the query form in a front-end page? without editing permissions of course. Not at present, I’m sorry. If demand for this feature increases I may include it in a future release. Thank you for your feedback. I wold like this feature. This functionality is now available in the latest release. Enjoy! initially my table was empty . when I manually filled a row then the columns and valued fields appeared. Yes – I was going to ask if the table was empty. I’ll add that to the list of known issues and will allow for empty tables in the next release. I installed the plugin and Configured the settings as suggested. 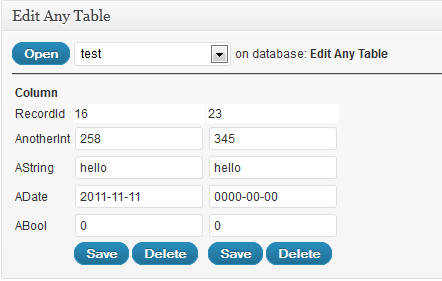 In my dashboard the interface displays the database and the tables within it. But on clicking on the ‘open, button the ‘column’ and ‘value’ don’t occur.What might be the problem? How can I make a search in a DB without using wildcards? Fuzzy search has now been added to this plugin.